I’m not really sure if that should be doodling or dawdling. 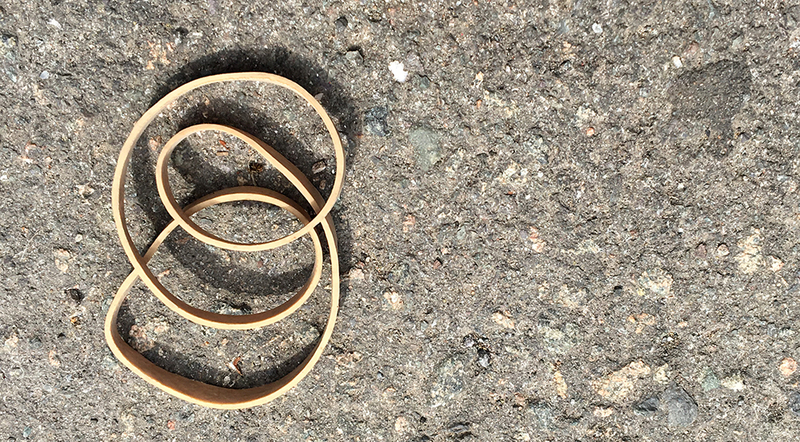 After all, if I’d been in a hurry, I wouldn’t have been paying attention to the bits and bobs of rubbish strewn across the pavement; it was only because I was dawdling that I noticed these doodles formed by a couple of rubber bands I suspect were dropped by the postman. The loopy patterns made me think of Möbius strips, which is a good reason to quote this fragment from Secondary Education, a poem written from the point of view of a middle-aged woman who realises she has learned the practical aspects of maths and science through everyday domestic situations. The mention of parallel lines and concentric circles always makes me think of lines of latitude and longitude. When I was a child, my family seemed to collect maps – from A-Z street maps of the towns we lived in or visited, to OS maps of the countryside where we walked, to framed reproductions of antique county maps. There was always an atlas to hand that could be consulted to find rivers, ports and capital cities when they cropped up in crossword puzzle clues, and there were also world maps with different projections – Mercator, Goode homolosine, Gall–Peters… – and, of course, a globe or two. I suppose maps are still a quiet passion for me: I probably spend more hours on Google maps and street view than I do on almost any other website or service and I can get really excited about the different visualisations of rail systems or such marvels as this page showing the least used stations in each UK county. 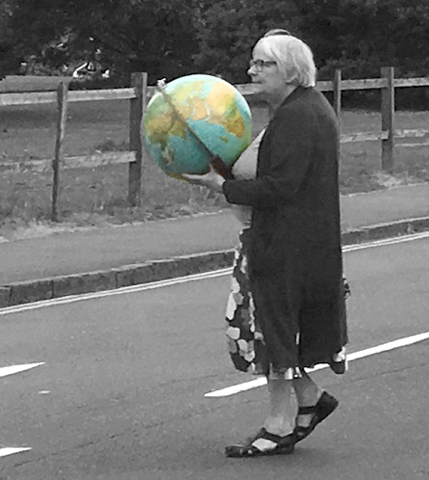 So naturally I was delighted to catch sight of this lady with the world at her fingertips the other day. If the bus hadn’t been dawdling, I might never have seen her and certainly wouldn’t have managed to get a photo.